Our Christmas Concert, Carol Singing at Sainsbury's and the Global Harmony Christmas Party all in the space of three days! This year’s Christmas Concert was held as always, in the magical surroundings of St Mary’s Church in Melton on Saturday 14th December and it is fair to say that it was considered the best ever. Even the afternoon rehearsal was critically acclaimed by a party who came to admire the church architecture and left enchanted by the singing, so we were told by a member of the audience in the evening. There was an excellent turn out of choir members, though quite a few singers who had unfortunately succumbed to various seasonal ailments were greatly missed. New members Tracie and Ann enjoyed their first concert and everyone felt the satisfaction of a sing well sung. I think the consensus was that our new Samoan song “Fa Fetai” was the highlight of the evening to sing and it certainly came over well on the recording. The date of the event came a week after the sad death of Nelson Mandela, wise statesman and force for good in this world. We were delighted and moved to sing two songs in honour of his memory; “Roli Hlahla Mandela”, a song we learnt with our French friends in Anjou, just after Mandiba first fell ill in July; and “Nkosi sikelele Africa”, the version the National Anthem adapted by Mandela to reflect the multi cultural nature of the country which developed under his presidency. Our audience was large and appreciative, joining in enthusiastically with the final song, another new addition to our repertoire, the lovely “Keep you in peace”. The icing on the evening’s cake was the fantastic sum of £1.065.00 we raised for our two charities, Rutland Sailability and Disability Snowsport UK. 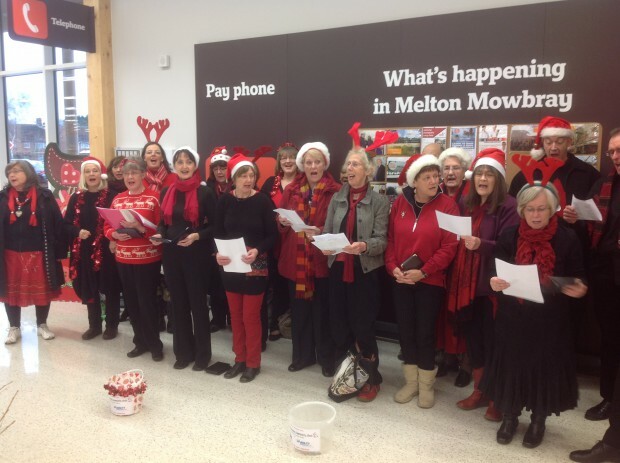 A small but perfectly formed group of singers assembled to sing carols in the new Sainsburys in Melton on the Sunday afternoon following the concert. Tops were very well represented, but a special mention goes to Cath and Ann, the sole altos who did a great job with the assistance of Liz. We really sang our socks off for the best part of 2 hours, who knew we had so many carols in our repertoire? Jingle Bells featured several times and we were all absolutely bowled over by a beautiful little girl of about 2 ½ who sang along with us twice then wished us a lisping “Merry Christmas, Ho, ho, ho!”. Our efforts left us hoarse but jubilant to have collected the magnificent sum of £230 for our charities. Your correspondent was full of anticipation for this jamboree, as she had missed it last year and heard very positive reports! She was not disappointed. The venue, the indoor bowls club at Melton was warm, welcoming and very festively decorated. The food was excellent value for money and service extremely efficient. The “Entertainment” ,devised by Paul and Alison Tully, was extraordinarily entertaining. Tables were tasked to write a song from the point of view of a Christmas character. Scrooges, Reindeer, Fairies, Father and Mrs Christmas, Lucky the Turkey, Elves and rather amorous Snowpeople gave their all in an evening of great hilarity and, indeed, of great talent both in composition and performance. Modesty forbids me to mention who won, as the standard was so high! Many thanks go to many people for the organisation of all these events, in particular my committee colleagues, Paul and Alison for a wonderful party and Steve and Ian for the recordings. Our charities will both receive £650.